Restrictions: Bureau of Land Management land. $6 per night for a campsite. No reservations accepted; first come, first served. How are the sky conditions? Exceptionally dark site; 6.2 magnitude in all directions. Comments from contributor: A very historic spot. John Freemont camped here with the Mormon Battalion before moving on to occupy Los Angeles. The famous trapper and scout Jedediah Smith also used the site in the early 1800s. Very colorful during the daytime. It is a great site for winter observing, but it can get as cold as a penguin's rear! Toilets present, but no running water. Railroad runs nearby. Restrictions: No fee, space first-come first served, usually space is available except on Holiday weekends. Directions: Reaching the White Mountains and the Ancient Bristlecone Pine Forest from Bishop, California is about a 1 hour drive. Travel south (14 mi / 23km) on hwy 395 to Big Pine, then east up hwy 168 to the White Mountain Road (13 mi / 21km). Here we turn left and continue the remaining 5 miles to Grandview campground; it is 7 miles (11km) up to Schulman Grove at 10,100' (3048m). Several vista turnouts are located on the White Mt. Road, the most spectacular being Sierra View Overlook (see panoramic photo). Click here to create a map using Mapquest or Mapblast. How are the sky conditions? DARK, most often cloud-free, seeing can be poor, windy, best in autumn. Comments from contributor: "In winter, forget it unless you are a polar bear (elevation 8,600 feet). Spring can be blustery and freezing as well. The campground proper is open only May-October, but if you can get somewhere nearby with a good view, you’ll be OK in off-season. Summer good overall, fall the best. If you have a big telescope (on a trailer) this is a great spot. If you have a really portable telescope consider moving up the road to 11,000’ or so if the weather is good. Overnight parking is restricted is some areas by USFS, so check with Rangers first before setting up. If you say you are not “camping” you’ll probably be OK. You should get accustomed to the altitude for a day or two first to truly appreciate these dark high-altitude skies. This site is not all that far from Conway Summit and is similar in weather and overall conditions, but is darker (I think)." Restrictions: Bureau of Land Management Land. Please pack all your trash out and no open fires permitted. Directions: Take Highway 40 East of Barstow. Exit at Ludlow and go past Amboy until you reach Cadiz. Follow the road and make a right turn BEFORE you reach the railroad tracks; if you cross the tracks you have gone too far. The Marble Mountains will be to your left. It's dirt roads once you turn right, go as close to the mountains as possible, preferably on the east side. Click here to create a map using Mapquest or Mapblast. Comments from contributor: "One of the darkest sites that I know of that is easily accessible to those who are not afraid of traveling on dirt roads. The roads are fairly smooth, rough in some spots, but quite passable. Highly recommended, far from the maddening crowds. Occasional Dessert Tortoise (hands off)." Restrictions: An Adventure Pass is required on all parked vehicles in the Los Padres National Forest area, which includes Mt. Pinos. Passes can be obtained at most sporting goods stores, some markets, and all Ranger stations for $5.00 (one night pass) or $30 (annual pass). Directions: From intersection of 10 and 405 freeways in West LA, proceed north on 405 until it merges with the 5. Continue north to Frazier Park exit (about 65 miles from 10/405 junction. Exit and proceed west (left of freeway) about 21 mi to Chula Vista parking lot (end of paved road). Several opportunities to turn will present themselves to you. You will not get lost if you stay straight at every intersection. Click here to create a map using Mapquest or Mapblast. Notes: 8,350 feet altitude at parking lot. Gets to 32 degrees F at night in the middle of the summer, so bring winter clothes! Comments from contributor: "Parking lot is ringed with trees. This reduces the wind and reduces horizon light. But it limits visibility if you are close to the trees on one side or the other. The best south is on the north side of the lot, the best north the opposite. "This is the most consistently good site for amateurs in southern CA. A paved lot makes setup near your car easy, the seeing is often sub arc-second, and if a marine layer covers most of LA to the southeast, it can reach mag.6.7 at the zenith. Recently, high altitude aerosols have limited transparency, but that's more typical of the winter months." 12 May 2012: naked-eye magnitude values revised. "These are based on AAVSO charts in the given directions. Backing down from a Sky Quality Meter reading gives slightly different (and better) results, indicating that visual acuity may limit the Naked Eye limiting magnitude estimates." Any restrictions: No special restrictions. No fees required, but call first to see if there are any staging area closures. Directions: From Healdsburg, which is two hours north of San Francisco on U.S. 101, take the Dry Creek exit off U.S. Highway 101. Travel west onto Dry Creek Road. The Park Headquarters and Visitor Center are located 11 miles northwest of Healdsburg. Various staging areas are available at the Recreation Area suitable for astronomy, including the Lone Rock Staging Area. Click here to see a map of the recreation area or create a map using Mapquest or Mapblast. Quite dark, seeing often fair to very good on typical evenings, humidity can range from low during warm summer periods to high in most any season. Air Quality is generally excellent. Modest light dome from Healdsburg/Santa Rosa to the south-southeast, significant up to about 8 to 15 degrees depending on humidity. Very small light dome northeast, generally insignificant. Best horizon: Lone Rock Staging Area - E through S through W, excellent, cutoff less than 5 degrees. Worst horizon: NW through NE, with N the worst, varies through 10 degree range. Comments from contributor: "Lone Rock Site is large, about 1,500' elevation, generally level, open packed gravel and dirt, enough room for up to 100 vehicles and scopes if organized. Horizon values somewhat variable depending on exact set up location. Picnic area adjacent, trailhead, potable water faucet, and in summer portable restrooms. Campground 1/2 mile to the south, lights from campground unobtrusive. Campground group site can be reserved for large observing groups. Astrophotographers should set up far from road to avoid occasional headlights. This site is frequently the far northern end of the San Francisco Bay fog belt, and the site may become foggy late on humid evenings. Site is often subject to mid- and high-clouds in winter. Not usually windy in normal years. A.C.E. Rangers here are extremely astronomy-friendly and accommodating. "There are also four group campsites that can be reserved in advance ($60 per night). Viewing possibilities appear very good, but with slightly higher cutoffs than Lone Rock. About 35 individual campsites are also available ($10 per person per night, first come, first served). Sites have mostly level paved parking areas. There are water and shower facilities adequately spaced around. About four of about 35 sites seem to have unobstructed views to the south and west. No question Omega Centauri could be seen from these. Note that the campgrounds lock down at 10PM, the rest of the facility, including staging areas, is open around the clock. "The best way to keep track of who is going there and when is to access The Astronomy Connection website and either sign up for TAC (free listserve, no fees of any kind) or just read the TAC archives for latest messages. There is discussion of who is going before actually heading out at night." Directions: North on Highway 395 to Conway Summit. In fact, practically all of Mono county has dark skies since the population is very small. Reno is 200 miles to the north and Las Vegas is 300 miles to the southeast. Just about anywhere will do and during new moon conditions it gets DARK! Most of the terrain is mountainous with elevation averaging around 7,000 feet. Click here to create a map using Mapquest or Mapblast. West has some sky glow but the main obstruction is the granite wall of the Sierra Nevada Mts which rise to over 13,000 ft. Comments from contributor: "I have observed at dozens of sites in Mono County and in Inyo County to the south and the conditions are superb. I never knew the stars until I moved here!" Restrictions: This is public land, so anyone can camp any time, so long as the road is open. Directions: From the west, take Highway 50 to Highway 89. East on 89, pass Markleeville, pass gate that has highway 395 information. Stay on road until you get to the plateau, about 14 miles from the center of town. There's a huge flat area on the left, in the center are what looks like one or two dry lake beds. Take the dirt road and set up where convenient. Note that, going east, if you get to the descent to Interstate 395 you've gone too far. From the east as well as Carson City, NV, take Interstate 395 to Highway 89 west. Climb for about 10 miles until you come to Monitor Pass on your right. Note that this area is unreachable in winter. Click here to create a map using Mapquest or Mapblast. How are the sky conditions? 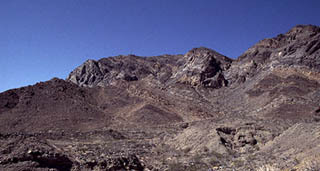 There are small light domes to the northeast and northwest, mostly blocked by a low ridge. You can see stars right down to the horizon. When there are no clouds, it's simply superb transparency. Comments from contributor: "This is an outstanding dark-sky site about 2-2.5 hours drive from Sacramento, California. The elevation (about 8,500 feet) and remote location are ideal for observing. Clouds to the north will turn the small light domes into a light-polluted north sky. The road is a couple of hundred yards away, and runs at right angles to the location. Headlights at night can be mildly bothersome, but there's very little traffic at night. This location is not available in the winter. Also, at times there are high winds (20-30 mph) which are not conducive to good observing. "There is room for at least 50 telescopes - even if they are big Dobs...BUT no services. This site is generally usable from July thru September, maybe extending into October depending on the weather. If there's not much snow the previous winter, it may be usable in late June with mosquitoes. Also, there can be yellow jackets in the daytime in July-August." Any restrictions: None. $5 fee for state park use applies, collected on the honor system. Directions: Henry Coe State Park is east of Morgan Hill. From Hwy.101, exit onto East Dunne Avenue. Continue for 12 miles, far past Andersen Reservoir, to the park, atop the ridge. Watch for an old-fashioned cattle guard. Continue another 4/10 mile, and enter the gate parking lot, on the right. No facilities. Click here to create a map using Mapquest or Mapblast. This site can accommodate perhaps 30 vehicles and telescopes. In addition to the big site, one may continue another 0.5 miles to the campground. There is room for a few vehicles in a small parking lot. Most of the campsites also have an open sky. Restrooms are nearby. How are the sky conditions? BIG OPEN SKY. From either site, there is a more distant city (Gilroy) to the southeast. For the main observing area -- From North, east, to the south, reasonably dark. From south to southwest, some interference; from west to north, very poor, with bright city lights of Morgan Hill in one's face. Overhead is reasonably dark. From the campground -- The west is bright but the city is hidden from direct view. Best horizon (direction and approximate altitude cut-off): East, about 5 degrees high. Worst horizon (direction and approximate altitude cut-off): Part of south, depending on just where one sets up, is obstructed by a tree. North is perhaps 10 degrees up. Comments from contributor: "Set up along the east edge of the area, with one's vehicle facing northeast. Put your scope to the southeast of your truck, so that you are in the shadow. This will block light from Morgan Hill, and also from possible passing vehicles. After dark, traffic is sparse." Restrictions: None, this site is a free public campground. Directions: Drive north from Los Angeles on state highway 14 (Antelope Valley Freeway), continue north through Palmdale and Mojave. Turn Left (West) on Highway 178 (Hwy 178 is approx. 40 miles north of Mojave, approx. 2 miles south of the turnoff to Ridgecrest). Travel up the hill on Hwy 178 approx. 8.5 miles to Walker Pass. The campground is about 300 yards past the summit on the left hand side. Click here to create a map using Mapquest or Mapblast. How are the sky conditions? Sky transparency is very good to excellent. Air stability is usually good to very good. The seeing is almost always better all around than the highly regarded Mt. Pinos observing site used by so many Southern California residents. This site is much darker to the south than Mt. Pinos, because it is fully 100 line of site miles north of the Los Angeles metropolitan area. There is a tiny bit of sky glow to the southeast from Bakersfield, a very tiny bit to the south from Los Angeles, and a little to the east from Ridgecrest. Elevation: 5000 ft. Comments from contributor: "General: This dark sky site is the best kept secret within "reasonable" driving distance from Los Angeles. It takes a little over 2 hours to drive to the site from downtown Los Angeles. Since driving to Mt. Pinos takes almost 1 1/2 hours, the extra minutes are really worth it. There are no trees to block the horizons, and it is much warmer in the cooler months than Mt. Pinos. Some people might hesitate to visit a site so close to the deep desert, because of winds and the resulting dust, but I have never experienced windy conditions at this site, due to the peaks in between the desert and the site. Even if it is very windy in the desert, it will not be at the site. The elevation (5000 ft) gets the observer above a significant amount of the atmospheric dust and haze, but the temperature is never in the "arctic" range. "Facilities: This is a free USFS campground on the Pacific Crest Trail. There are only 3 improved campsites with adjacent parking, but in the many times I have visited this site (about 20), I have never seen all three spots full. This includes the Labor Day and 4th of July weekends. Campsites have fire pits with metal pull over grates, picnic tables, and even sunshades over the tables. There are also many more campsites without adjacent parking." Comments from another contributor: "Walker Pass campground is off a secondary highway. Although far enough away that headlights will not shine onto the campsites, you have to be careful not to be looking toward the road when someone passes by. Trucks use the road, and their air brakes roar on the steep incline until the wee hours of the morning. "Despite the previous reviewer's note that the three campsites are rarely occupied, two sites were taken by day hikers when we arrived. We set up at the lowest (worst ) site, then one group of hikers left and we moved to the middle (best) site. Eventually, the group of hikers at the upper site also left, but both sites became occupied again later in the evening. I'd recommend getting to the campground early for a good site, and being prepared to move to a better site if it becomes available. The horizon is blocked by a picnic table cover structure at the lower site, and by large bushes at the upper site. "The site is much further than 300 yards from the summit. We were convinced we must have passed it! It was over seven miles on the 178 to the site, and not five. (Normally, this small distance wouldn't be critical, but in such an isolated area, you really wonder if you're anywhere near the right place.) The GPS coordinates are N 35°39.847', W118°02.255' - Elevation 4974'." How are the sky conditions? Great in winter and summer, some fog or moisture in spring and late fall. Winter overnight temps can be cool (20s to 30s) because of 3,700 ft altitude [Note from PH: Remember, this is San Diego talking. Many of us would give our right arms for those temps during the day in winter! :-)] Summer overnights are shirtsleeve, but days are 100+. Fall Santa Ana winds or winter storm winds are not to be believed! Not much light pollution to south. Light pollution in west from Tijuana and Tecate and San Diego. Best horizon (direction and approximate altitude cut-off): South, flat but lot has 6-foot manzanita brush. Can see Omega Centauri in spring! Comments from contributor: "Great 10-acre club-owned site with power, water, johns, concrete pads, pay phone." Directions: Fremont Peak State Park is south of the Village of San Juan Bautista. From Hwy 101, about 11 miles south of Gilroy, take the eastbound Hwy 156 exit. Drive for 3.0 miles, to a traffic light, and turn right onto county Hwy G-1. Take the second left, then a quick right to stay on the road! Follow G-1 for 12 miles into the park. Be careful to note the “left/right jog” about 1/4 mile after the turn; signs are posted. The park charges $3 entrance fee. Click here to create a map using Mapquest or Mapblast. Comments from contributor: "The northern sky is somewhat polluted by Gilroy and San Jose area lights. The southern horizon is now polluted some by strong lights from the Soledad Prison. If the fog from Monterey Bay comes in at below 2,500 feet, the skies at Fremont Peak can get quite dark. "The south west horizon has a nearby mountain peak with radio and television antennas obstructing about 25-degrees of the horizon but kills a lot of light from the city of Salinas on the other side of this peak. "Fremont Peak is home for the 30-inch “Challenger” telescope. The Observatory is at the 2,700-foot level."